An ePortfolio, or an electronic portfolio, is an organized collection of your best creative works. These virtual viewbooks are a digital record of your major projects and experiences, giving you a competitive edge when the time comes to enter the workforce. It’s no secret that today’s job market is competitive. Most employers now expect candidates to have an ePortfolio. Additionally, it is a required assignment for students completing an internship. 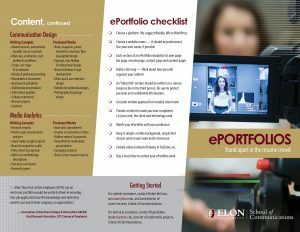 To make sure you stand apart in the resume crowd, check out our ePortfolio brochure that highlights content that should be included in your ePortfolio. The following videos and links will help you get started. There are many resources online you can find through searches.